As their name implies, Korg's new MIDI keyboards are all about hands‑on control. Korg have been riding high recently with their eclectic line‑up of Monotrons, Volcas, MS20 reissues and workstations. They've not traditionally been a player in the full‑size controller keyboard market, however, so what can the Taktiles offer that manufacturers like Novation and M‑Audio don't already? The Taktile 25 and 49 have similar capabilities and styling, but are differentiated by the keyboard compass (two or four octaves), number of drum‑style trigger pads (eight or 16), and the provision of physical controls. The Taktile 25 has a bank of eight faders and buttons, and that's supplemented by another eight knobs on the 49. In all other respects they're the same. The keyboard is velocity but not aftertouch sensitive. There's the typical modulation/pitch wheel duo, and octave transpose buttons to access the outer reaches of the pitch range. Those trigger pads are also just velocity sensitive but illuminate when you tap them. In the centre of the control panel sits an X/Y touch pad with a ribbon strip beneath, next to a small OEL (Organic Electroluminescent) display that displays crisp white text on a dark black background. A row of transport buttons promise some kind of DAW control, and there's a handful of mode buttons scattered elsewhere on the panel. Connection sockets are mounted in a recessed panel on the right cheek: a USB B port for hooking up to your computer, MIDI In and Out on five‑pin DINs and a pair of quarter‑inch sockets for switch‑type and continuous pedals. While the Taktile's case construction is strictly plastic, it's finished to a really good standard. A subtly sculpted, thoroughly modern‑looking top panel is married to a light, textured, futuristic base — not that anyone will ever really see it. In typical use, and when transported, there's no flexing or creaking, and all physical controls feel consistent and reliable. Everything seems set to provide a long working life. Provided with each Taktile is a USB cable, a concise multi‑lingual instruction sheet (of the type that folds out to the size of a broadsheet newspaper), and a code for downloading a software bundle and some other offers. You get the M1Le virtual synth, Toontrack's EZdrummer Lite, AAS's Ultra Analog, Strum Acoustic and Lounge Lizard 'session' versions, Propellerheads' Reason Limited DAW, and a discount coupon for Ableton Live. Also available via download is a proprietary MIDI driver, a dedicated Kontrol editor application for programming the Taktiles on your Mac or PC, and a plug‑in for Mac that enables DAW control in Apple Logic X and GarageBand. At first glance everything about the Taktile looks pretty straightforward and predictable, and to a very great extent that's borne out in practice. After connecting to your Mac or PC, the Taktile instantly springs into life — there's no power switch. Then only a few moments of noodling are enough to confirm that the keyboard action is honest, light and reliable. The marketing spec mentions 'semi‑weighted', but I wouldn't go that far; it's a nicely sprung synth action, pure and simple. Going on to explore the rest of the control panel reveals that virtually all buttons are capable of being illuminated, giving useful feedback about their current operational state. The Octave buttons, for example, light in different colours or flash to show the extent of transposition in place. The trigger pads operate in one of two modes, accessed with dedicated buttons. In Note/Control mode, the pads transmit MIDI notes, continuous controller data or program change messages. You'd use that for typical drum playing, though it's capable of far more. Chord Scale mode, on the other hand, has the pads generating chords according to a key and scale/tonality chosen elsewhere in the editing system (of which more in a moment). It's ideal for non keyboard players wanting to play chords in any key. And there's a really nice associated feature too: the touch strip beneath the X/Y pad can be set up to control chord complexity in real time, so you can play pad chords with your right hand while continuously varying their voicing with a left-hand finger. What's more, engaging the 'Arp' button causes any note data (generated from either the pads or the keyboard, in fact) to be arpeggiated, with various shapes and retriggering options available. The arpeggiator will happily sync to an external MIDI clock signal, from USB or the MIDI In socket, too. 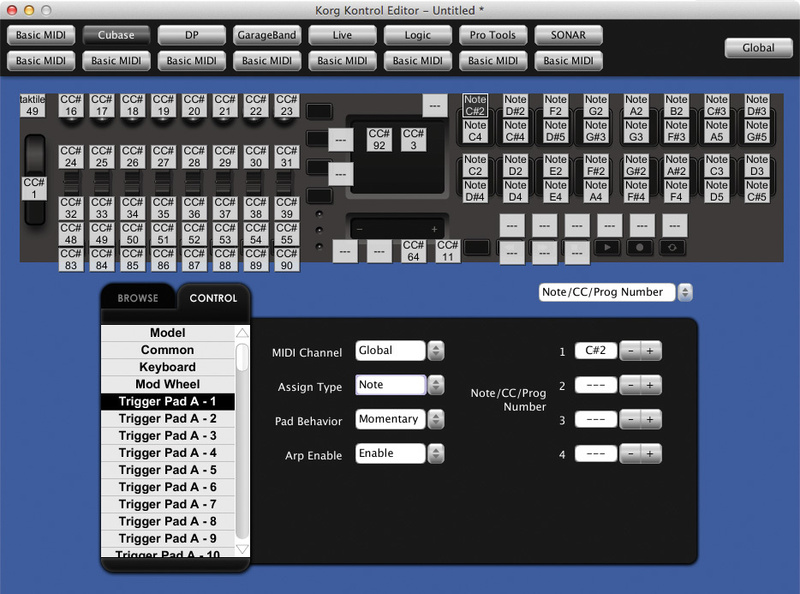 Korg's Kontrol Editor isn't the prettiest app I've ever seen, but it makes programming and generally configuring your Taktile quick and easy. Meanwhile, the way the faders and switches (and the Taktile 49's knobs) operate is an object lesson in clarity. Straightforward MIDI controller functionality is delivered when you engage Control Mode with a dedicated button. Then, when you move (or press) a control the small but very clear display shows the MIDI data type associated with it, and keeps you updated on the values you're generating. Programming is also reassuringly easy, with the entire system navigated using just a few buttons, and the display giving useful prompts. The ribbon strip comes into play here too; parameter values can be quickly changed with a swipe left or right, or the outer edges tapped (on the +/‑ labels) to increment more finely. While you sometimes find yourself shuttling through multiple pages of options, there's no real 'menu' system as such, and Korg have done a great job at making surprisingly deep editing flexibility readily available. Need a fader to generate a restricted or reversed value range, or messages to be restricted to individual MIDI channels, for example? All that and more is easy to set up. Now for that X/Y trackpad. In its Touch Scale mode it generates note triggers (the X axis) and MIDI CC data (the Y axis) so you can play it (when driving a suitably responsive instrument) like Korg's own Kaossilator. Control mode just maps two continuous controller types to the X and Y axis — filter cutoff and resonance are the glaringly obvious candidates here — to be prodded and stroked as you play the keyboard conventionally with your other hand. All these settings can be saved for posterity into one of 16 'scene' slots, together with a name of your choosing. From the factory eight slots are already spoken for, but in fact any can be overwritten. And if you use the Kontrol editor application, unlimited numbers of scenes can be stored on your Mac or PC, and pushed to (or pulled from) the Taktile. Kontrol makes general programming even more straightforward, and arguably gives a better overview of specific as well as global settings like key and trigger pad velocity curves, display brightness and so on. While the link between Kontrol and your Taktile isn't completely 'live', it's nevertheless hard to get the two out of sync, and I didn't encounter any difficulties whatever. The Taktile's basic controller functionality is undoubted, but it goes beyond that, and in a few different areas. Firstly, and most significantly, it provides transport and mixing functionality in many DAWs by mimicking, to some extent, a Mackie Control hardware surface. Dedicated scene presets can be called up for Cubase 7, Live 9, GarageBand 10, Logic Pro X, Pro Tools 10, Sonar X2 and Digital Performer 8, and Korg provide brief but perfectly adequate set‑up instructions for how to get up and running in those DAWs. As it happens, real Mackie Controls do their stuff by generating only quite simple MIDI messages, but also maintaining a bi‑directional link with the DAW, so that, as well as actually 'controlling', they also update to display any changes made directly in the DAW. Korg's implementation works fine in this respect, and as well as Play, Stop, Record, Forward and Rewind transport controls and a loop playback toggle, there are also marker and 'jump to next/previous' commands. The eight hardware faders link to your DAW mixer channels, and the pair of Track buttons switch control focus through banks of adjacent eight channel groups. On the Taktile 49 the knobs predictably control pan positions, and the F keys below toggle Solo, Mute or Rec (record enable) status according to the current Assign button mode, indicated by one of three LEDs. OS X's Audio MIDI Setup application reveals the multi‑port nature of the Taktiles' MIDI implementation.Next, there's an additional computer‑friendly mode for the X/Y touch pad, Track Pad. Accessed with a single button press, it switches the pad to control mouse-pointer position on your Mac or PC. Tap‑to‑click is supported, as well as two‑finger drags to scroll. The ribbon strip beneath also then splits in two to emulate left or right mouse clicks. 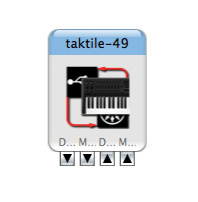 Finally, the Taktile's MIDI implementation is deeper than it might first appear. When you use Korg's proprietary driver, a connected Taktile appears to Windows or Mac OS as a device with three different MIDI ports: Internal (for standard controller usage via USB), DAW (for configuring in relation to the Mackie Control features), and 'MIDI I/F' (which addresses the hardware MIDI ports). Far from complicating issues, this makes it a little easier to separate out the varying roles that different users might have in store for their Taktiles. Rather than crescendo to some totally predictable conclusion, I might as well come out with it now: the Taktiles are stylish, sorted, playable and notably flexible controllers that deserve to do really well. I liked the build quality, the keyboard action and the feel of the pads, which can be hit equally well in the middle or at their edges to trigger reliably. The buttons, faders, wheels and pots feel strong, don't wobble, and produce consistent results. And despite being the size of a postage stamp the display is very good; sharp, clear, and miles better than any LCD. It's worth noting though that its slightly recessed mounting in the panel means the lowest rows of pixels aren't visible if you're viewing your Taktile from lower than about 45 degrees. Oh, and I should mention how good it feels to have so many buttons that perform just a single function — there is no Shift button. That contributes to ease of use no end; I felt like I'd mastered the Taktile interface in five minutes flat. Illumination of buttons and pads? Yes, very nice, very funky and helpful in confirming the current mode selected for the trigger pads and X/Y pad, amongst other things. The only problem is that when buttons aren't lit their grey‑on‑black lettering makes for lousy legibility, and I found myself peering and squinting even in quite good lighting conditions. In a pit, club or on stage you might want to pack a headtorch. If only there was a way of getting constant low-level illumination, that would help usability enormously, and look spectacular. Korg, if you could, would you please? The Taktiles' connections are found at the right‑hand end of the keyboard and include quarter‑inch sockets for external pedals, MIDI I/O ports and a USB connection. The X/Y pad and ribbon strip are great to have, and require only the lightest of touches to track reliably in Touch Scale and Control modes. They don't make for a very good Mac/PC trackpad though. In that role the X/Y pad feels too small, grainy and indistinct, and not at all like a good laptop trackpad. However, while you probably shouldn't expect a Taktile to replace a dedicated mouse or trackpad, it is still useful to have this additional mouse-pointer control option available. It's ideal for OK‑ing the odd DAW dialogue box, and for tweaking plug‑in and virtual instrument parameters, without having to move your hands too far from the keyboard. 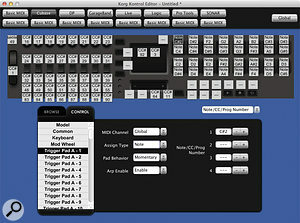 By far the most mixed and least consistent part of the Taktile experience are the DAW controller features. Overall, the transport controls are useful to have and worked reliably in my tests, but they're incomplete. I particularly missed a return‑to‑zero, and the ability to both define loop points (as well as just turn the loop on) and punch in/out locations. The greatest drawback of all though, for DAW control, is those unmotorised faders and non‑endless knobs. In two Mac DAWs (Live 9 and DP8) I used for testing, no 'pick‑up' behaviour is evident, which means that any time there's a mismatch between the DAW mixer controls and Taktile's faders and knobs (which in practice is most of the time), the next touch of a physical control instantly obliterates the current associated value in the DAW. It's vaguely workable, in a clunky, antique sort of way, if your mix has eight channels or fewer. But for more than that, when there will be the need to switch fader banks on the Taktile, you're better off not bothering. I'm not sure Cubase, Sonar or Pro Tools fare any better in this regard, and in any case it's hard to make definitive statements, since this sort of third‑party support is notoriously liable to change (or indeed break) as DAWs and OSs evolve. Incidentally, I did try my luck with an unsupported DAW, Presonus's Studio One, and got some transport and mixing functionality going via its own Mackie Control support. Some commands were missing in action, though. Things are better in Logic X and GarageBand, thanks to the control plug‑in Korg provides for these DAWs. Fader and knob pick‑up is enabled here, and consequently mixer control is viable. The touchstrip also unexpectedly turns into a kind of 'jog' for shuttling playback position. But it's all a long chalk from an actual Mackie Control (or even a tablet‑hosted emulation), and I encountered other problems. In GarageBand the link between DAW and Taktile never activated by itself; I had to reset MIDI drivers every time I started the app, and then the Taktile goes into some undocumented 'Native' mode where you can no longer program any controls, or even engage the Control Mode that is required for tweaking plug‑ins and VIs via MIDI. As for other problems, there were none really. I did notice a USB powering anomaly, though. When either Taktile model was plugged into my standard USB 2 powered hub everything worked fine except the pads, which would generate note-on but not note-off messages, and start lighting up permanently. The Taktiles appear to draw a little more current than the 500mA supplied by most hubs, but they always worked fine when plugged directly into my MacBook Pro. 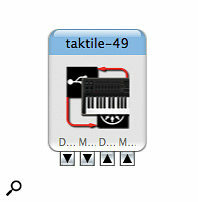 In summary then, the Taktile 25 and 49 do offer something fresh on the MIDI controller scene. DAW mixer control might be a work in progress, but in every other respect they're about as good as it gets. Nice keyboards, fine build quality and looks, flexible control options, easy programming partnered with a good display, and an unexpected bonus in the form of the X/Y pad's various uses. The Taktiles feel like thoroughly up‑to‑date products, and could well prove to be studio workhorses. Selling alongside the two Taktiles on test here are sister versions with built‑in sounds: the Triton Taktiles. They don't offer any less functionality, but include 500 presets derived from Korg's venerable (but no longer current) Triton workstations. Sixteen of those can be recalled with a single button press. For some users the onboard sounds will be useful. But it's worth noting they can't be edited, layered or split, and playback is strictly mono‑timbral. It's not the same as having an actual Triton on hand, preset or not. The Triton Taktiles also come in 25‑ and 49‑note versions and cost £311.99$349.99 and £407.99$499.99 respectively. Quality synth‑style keyboards and pads. Excellent control options and a swift, clear programming system. X/Y pad supports useful additional playing and control methods. DAW control features are half‑baked. Colour scheme makes some labelling hard to read. Requires a healthy current from your USB port. 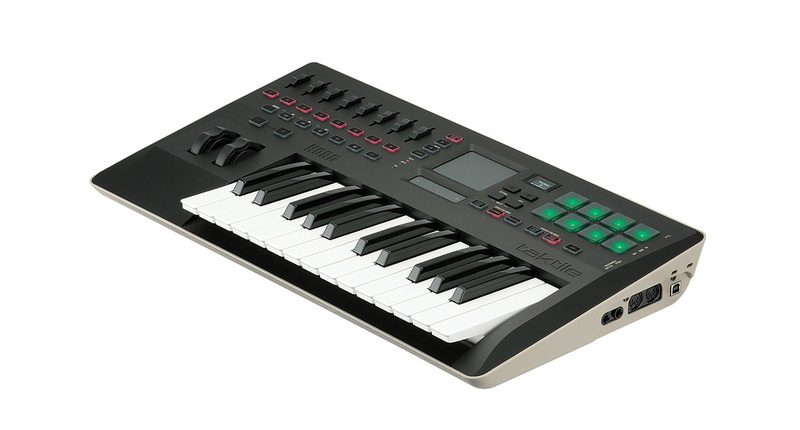 Korg have conjured up a pair of fine controller keyboards in the Taktiles. They're by no means budget models but are modern, flexible and easy to use. The DAW control features are half‑hearted, but regard them as add‑ons to the solid core functionality and most buyers should be more than happy. Taktile 25 £215.99, Taktile 49 £311.99. Prices are RRP and include VAT. Taktile 25 $249.99, Taktile 49 $349.99.